So, we need a 301 redirection from abhishekghosh.net to dr.abhishekghosh.net. But we are not using a server or rather not willing to pay for a server. As the reader can understand, dr.abhishekghosh.net can easily be pointed towards Rackspace Cloud Files as for subdomain, CNAME can work alone. We add A or AAAA record when the subdomain is a different server, right? There are two ways to get this plan working. Quite obviously, www is also a subdomain, the example will be like my dr.abhishekghosh.net subdomain. Heroku and OpenShift killed many profitable businesses! Official ways are paying for some service. Root domain should always be an A record, in traditional usage. CNAME means canonical name, which is actually alias. We take that, there should be a server with IP to get websites working. We have not used yet, but it appears that Hover is a good service for both email hosting and DNS redirection. Ultimately we have to pay for the domain, Hover does it. Basically we wanted to explain how Pointing Naked Domains to CNAME works. Subdomain things made it complex but you probably understood the basics – still, with current technologies we need something which will act both as A value and point towards the CNAME. Usually the something is not directly available. We are trying to find some other cheat for Akamai – Rackspace Combination. This Article Has Been Shared 4448 Times! 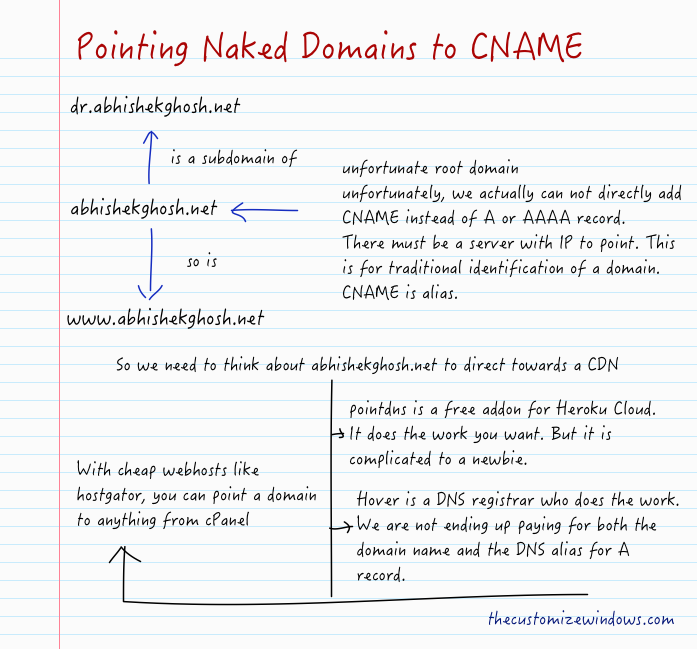 Cite this article as: Abhishek Ghosh, "Pointing Naked Domains to CNAME," in The Customize Windows, May 20, 2014, April 20, 2019, https://thecustomizewindows.com/2014/05/pointing-naked-domains-cname/.